The fastest way to make more profits is to keep more margin. Why? Because your profits immediately increase for the same amount of sales. The fastest way to increase margin: raise your prices. Go here to learn why raising makes sense for lots of companies. Yet many salespeople are terrified of selling at higher price. They’d much rather lower prices. 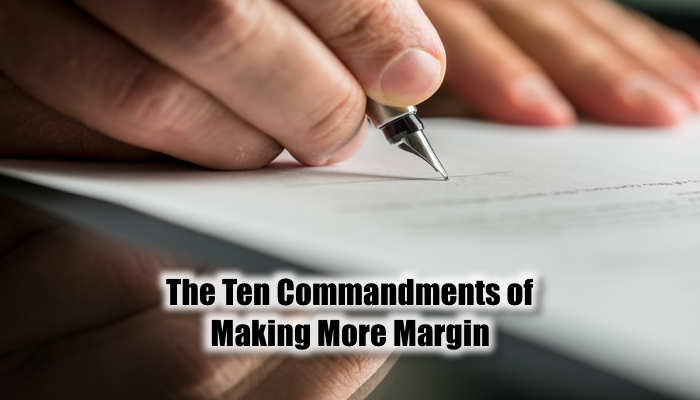 This list explores 10 ways other than raising prices to increase your margin, each which can drastically improvement your profits. When you focus on the product, your customer always compares you with other options, which invites price comparisons and drives demands for discounts. A customer doesn’t buy a drill, they buy holes. Instead, when you focus on selling your product’s outcome, price becomes less important because the customer is sold on the value of what you deliver instead of how you deliver it. More customers want done-for-you experiences. With more time pressure and a shortage of good help, your customers want to buy everything ready assembled, getting the full package instead of just the pieces that they have to put together. Projects and product bundles create substantial increases in margins, especially when customers don’t know how to price out the parts. While this commandment sounds counterintuitive to some salespeople, you always make more margin on subsequent sales than you do on the first sale. Your most profitable business comes from customers who know, like, and trust you. You don’t have to discount or use expensive sales tactics to get them to buy. They know you’re a low risk, sure thing. While it’s important to expand your customer base, it requires an investment in marketing and sales activities to do so. Make more margin now from your customers and reinvest that in prospecting for new ones. It’s hard to make solid margins on products that you don’t like, value, or respect. If you feel you’re overcharging for a product, it’s almost impossible for you to sell at full price. So either understand the value of what you’re selling or sell something you find valuable. Lowest price motivates about 15 percent of the population and the Federal government. Make sure you have a solid feeling of your value so that when you quote the price, your confidence makes the price stick. Instead, sell to people who must have your offering to accomplish their job. Sell to people who give a damn about what you sell. They have appreciation, respect, and understand the product value and can pay more when it makes their life easier, more efficient, and more flexible. A great way to make more margin is to say “no” to unprofitable deals. The best way to drive your competition out of business is let them have all the unprofitable business. Why? You think they’ll place the next order at full price? Forgetaboutit. The only time you might consider no-margin deals is if it’s a proof of concept and you have a contract for future business at margins that make business sense. And the problem with that is you’ve tipped your hand on how low you’ll go. Better to loan it to them and build the margin into future sales. Very few companies can be wildly successful with a business that relies on single transaction with customers. Wall Street rewards companies with repetitive revenue streams with a stock price of four to 10 times more than if the same revenue was just transactional. Wouldn’t you love it if on the first of month you have sufficient sales to cover your expenses? That’s what a relationship-based, recurring revenue business does for you. To do this, shift your focus to opening relationships, not just closing deals. The desirable difference between your product and another option is often you. Many sales and business consultants recommend becoming a trusted advisor. While this seems a reasonable approach, an advisor is usually limited to a specific topic, putting you in a box. What’s preferable: be positioned as a business advisor, providing insights, services, and products that support their business roadmap. Do this and you become a trusted partner, invited to the table anytime the company needs to figure out a way to implement their roadmap. From this position you make substantially more margin. Old-school salespeople pitch features, advantages, and benefits in an attempt to map the product to the customer’s motivation, persuading and convincing them to buy. The pitch ends with a today-only special price. It’s hard work, creates a lot of friction, objections, and resistance along the way, and always erodes margins. Instead spend time to learn about your customers and what motivates them. When you map their motivation to the product, sales becomes frictionless, and you keep much more margin. What motivates buyers is often different than you think because their success is judged differently from yours. Understand what motivates executives, the people that set budgets and approve major purchase. With this insight, you can do a much better job creating confidence that you are the best vendor, even when your prices are higher than the competition. Assume everyone who buys from you is a trained negotiator. Have you been trained to counter their tactics? If not, it’s costing you margin in every deal you negotiate. A commercial buyer negotiating a lower price is taking money out of your pocket, not putting it in theirs. Consider this: if you can negotiate fewer discounts to keep more margin, it’s the same effect as raising your prices, driving more profits immediately to your bottom line. You could pay for negotiation skills training with the increased margin of your next deal. I co-authored a book on how to counter buyer’s negotiating dirty tricks and tactics, Guerrilla Negotiating. If this makes sense, let’s talk about how I can help your team learn how to keep more margin and still win the deal. Let’s have a conversation about speaking at your next event, growing your business through strategic planning, marketing plans, executive coaching, and customer acquisition systems. Find a mutually agreeable time at MarksSchedule.com or message me through LinkedIn. If you’ve made it this far, please share.